The phones are ringing off the hook and the sound and sight of inefficiency is maddening—no one is happy. You try to move, but can’t. Thankfully you wake up and realize it was just a dream. 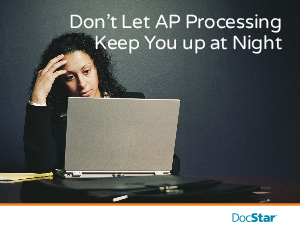 Wiping the drool from your cheek, you resolve to update your own AP process before it’s too late. This scenario is a familiar recurring nightmare shared by many Accounts Payable Managers, Controllers and CFOs—and for good reason. Without scalable AP and invoice processing, your business cannot flourish or reach maximum potential. In this eBook, we’ll show you how integrating your AP processing with your accounting software will help you save time and money, allowing you and your team to focus on your customers and your business.